Paul Duncan majored in Psychology, and has a degree in Applied Science. He continued in his Air Force career to successfully complete three different career fields: Power Production, Digital Radio Maintenance, and then Aircraft Maintenance. He is currently an Electronics Technician, Aircraft Avionics Technician and fantasy writer. While stationed at Chanute A.F.B Illinois, Paul Duncan was in the REC center listening to the classic Beatles songs for the first time. When he heard Paperback Writer, he was inspired to write a novel along the lines of The Hobbit. After much study and research on the subjects of ancient Rome, Viking lore and medieval Japan, he created the unique novel Prishum's Revenge. He will continue working in the electronics field until the third book of Prishum's Revenge is completed. His Author Image selfie shows the B-25 Mitchell which had just returned from Italy for filming the latest version of the movie Catch-22. Prishum’s Revenge: The Battle for the Underground City by Paul Duncan is a compelling epic fantasy tale with an unlikely protagonist. The inhabitants of the continent of Euratwin have been subjected to the worst forms of treatment from the Legions of Marduk that come down from the Frozen North, pillaging and crushing everyone who stands in their path. But now the tides are about to turn as a small boy loses his parents and vows to exact revenge. Once a descendant of a peace-loving people, Prishum finds himself under the care of a ninja master. He trains with specialized weapons and develops the art of spying, determined to kill those who killed his parents. It is a dangerous and difficult path, but the destiny of a continent may depend on him. Can he answer the calling when the moment arrives? What struck me when I started reading this novel was the author's gift for vivid descriptions, his ability to rouse the reader's imagination and fill it with powerful imagery. The reader has a clear idea of a unique species of humans and the conflict begins on the first page, with a conversation between the protagonist's parents, a conversation he isn't supposed to hear. The prose is a thing of rare beauty and Paul Duncan has a unique signature for phraseology. The paragraph breaks are timely, crafted for dramatic effect, the dialogues are exciting, and the world building is impeccable. The author invents a world and thrust readers into it; a world of adventure, with a story filled with action, and rock-solid characters. Prishum’s Revenge: The Battle for the Underground City deserves more than a five-star rating, for it is full of potential, both masterly and engrossing. Prishum’s Revenge by Paul Duncan is a fantasy adventure set in a world where multiple intelligent species coexist. The hero of the story is Prishum who looks, for the most part, like a rabbit but he has certain human characteristics as well. The story also includes wolf creatures, vampires, elves, humans, and zombies. Prishum’s journey begins when he is a child. He is witness to a horrific event that sets him on a course for revenge. He meets many colorful characters as he matures that help to shape him into the warrior he will need to be in order to carry out his heart’s desire. Prishum’s Revenge moves at a fast pace as it follows Prishum through the many stages of his young adulthood. It’s a narrative that starts off simple with one rabbit’s passion and builds into all-out war. To me, it came across as a tall tale, focusing more on the action than character development. That being said, the characters in Prishum’s Revenge are still very imaginative and fun. A good comparison is to say Prishum’s Revenge is more like Tolkien’s The Hobbit than Lord of the Rings. The former was made for younger audiences while the latter was made for adults. Prishum’s Revenge reads like a book for young readers, but be warned, it contains adult themes and adult words. It has another similarity to both of the above-mentioned books by Tolkien that I found delightful. That's the interaction of the different species as they exist in the same world together. Author Paul Duncan has done a fine job of creating a world full of beings who get along sometimes but many times don't get along at all. That kind of multi-cultural tension was one of the highlights of Prishum's Revenge for me. Overall, this book is a fun read. It’s exciting and very creative. 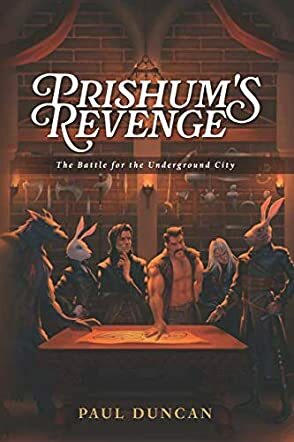 Prishum's Revenge: The Battle for the Underground City by Paul Duncan is a brilliantly-written epic fantasy adventure that begins with the Legions of Marduk pillaging the towns and villages on the continent of Eurotwin. When the legionnaires murder young Prishum's parents, he escapes and boards a ship. To save him from his crew, that are looking to make rabbit stew out of him, the ship's captain protects him, and then bids him farewell with advice to become an apprentice to a weapon smith. Prishum is trained as a blacksmith in the art of weaponry, as well as ninjitsu. He meets Tissa, who tells him that they are the only survivors of their kind and it is up to them to procreate their race. When Prishum learns that the Legions are returning, he goes out to do combat with them but barely escapes with his life. Needing better weapons and armor, he seeks out the lord of the underworld. Duncan has created a masterpiece of a parody that combines epic battles, fight scenes, and a whole underworld of the undead that will have you laughing out loud with references to nostalgic one-liners from the 1960s, '70s and '80s. Paul Duncan's sarcastic wit is evident throughout Prishum's Revenge, but really comes to life in the netherworld, with a seductive vampiress, skeletons, dark elves, and the list goes on. When it comes to the Battle of the Underground City, the author does not pull any punches. As Prishum's popularity grows wherever he goes, there is always the twang of disdain to keep our hero humble. Prishum's Revenge fires on all cylinders in a fast-paced, laugh out loud adventure that I just couldn't put down. This rare gem has all of the elements to become a cult favorite. Bravo! Prishum’s happy life is turned upside down when the evil legions of Marduk march through Euratwin and destroy everything in their path. Prishum’s Revenge: The Battle for the Underground City by Paul Duncan tells Prishum’s tale from the fateful day when he watched his parents’ murder by two cavalrymen until the time he can take his revenge on them years later. After escaping Euratwin, Prishum becomes the first Lago, a rabbit-like humanoid, to become a warrior, learning the arts of the assassin from a master in Nipponesia. Growing strong and lethal, Prishum returns home where he joins the inhabitants of a secret underground city and plans the defense against the kings from the Frozen North. An epic battle ensues and the future of Euratwin hangs in the balance. Will Prishum be able to carry out his desire for revenge against the men who took his parents’ lives or will the strength of the legions prove to be too much? Paul Duncan has created a marvelous world, cleverly using some real locations and traditions to help make sense of his unique characters’ actions. Combining a variety of character types, including supernatural creatures, and great action, Duncan makes every page of Prishum’s Revenge come alive. You can feel the fear of the young Prishum and then experience his physical and emotional growth as he prepares to take revenge on the men who changed his life. Prishum’s Revenge: The Battle of the Underground City shows that anyone can succeed with determination and hard work. Prishum's Revenge: The Battle for the Underground City by Paul Duncan is a gripping fantasy that follows a young hero, Prishum, orphaned by a ruthless enemy. In the world of Euratwin, its villages are pillaged and trampled upon from time to time by the Legions of Marduk, coming from the North. No one dares stop them. No one has the power to stop them. The protagonist escapes Euratwin in a ship and applies himself to the art of killing. He is driven by revenge and lives with one consoling thought: to be able to exact revenge on the two men who killed his parents. But what lies before him could be more than that, and is his training enough in the fight for the underground city? While the opening is not explosive, Paul Duncan succeeds in exciting the curiosity of the reader and getting them to love the protagonist. I wanted to discover the fate of this young man who eavesdrops on his parents' conversation about him. The conflict is introduced at a small level — it is psychological from the start — but it grows rapidly and becomes a crisis in no time. The plot has many layers of intricacy and readers will delight at the surprising turns the story takes. The prose is highly descriptive, with measured and well-crafted dialogues. The plot is balanced and deft, the narrative is focused and the point of view comes out with unusual clarity. The setting is an imaginary world that looks so much like ours, with people that have their shared peculiarities and a culture that is typically theirs. Prishum's Revenge: The Battle for the Underground City is action packed and features exciting scenarios that transport the reader. A very good read, indeed.